Membership is open to all who express an interest and active participation in sailing and offers many benefits – Apply for ABYC Membership online HERE. The history of Algoa Bay Yacht Club begins in the 1880’s. In this period the waters of the Zwartkops River proved to be a great attraction and the Beaconfield Yacht Club, later named the Zwartkops Yacht Club, came into being in 1884. Further up the river Redhouse Yacht Club was formed in 1904. The river made a wonderful venue for dinghy sailing and in the early years many Provincial and National championships were held there. However, the river was gradually silting up and with more and more yachts competing in less and less water it became inconvenient for large events. In 1948 an advertisement appeared in the local press inviting any interested parties to attend a meeting at the Edward Hotel with a view to forming a club to use Algoa Bay as a sailing venue. Only nine people put in an appearance, but a committee was formed to pursue the cause. Ronnie Lambson was elected to the chair and Harold Kohler, Ken Pearson and Bill Cross were members. 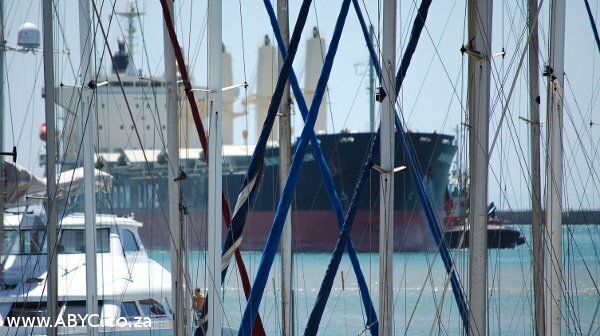 Local Port authorities were far from enthusiastic at the prospect of a number of amateurs cluttering up their harbour and causing mayhem amongst the traffic in and out. Nevertheless they persevered and eventually a letter was received from the local M.P., Mr.W.M.Oosthuizen, advising that the then Minister for Railways and Harbours, Mr.F.C.Sturrock, had ruled that a piece of land, within the protection of the harbour, be earmarked for a yacht club. Local authorities retaliated by asserting that space limitation precluded this being done. There the matter rested for 22 years. At the time that the public meeting was held the owners of three yachts had prevailed upon the authorities to allow them to moor their craft in the harbour. Mr.A.Nilsen owned “Bess”, a ketch rigged, double ender. Roly Benn, a descendant of the famous Knysna pilot family, had “Ilowe”, a drop keel, hard chined yawl of some 25ft., and Arthur Jenkin’s “Melody” was a familiar sight anchored off S.A.S.Donkin. Sailing in the Bay was barely tolerated and Port Authority’s rein was tight. The sailing activity was limited to daylight and its extremities confined to the Bell Buoy and yachts had to stay within sight of the small harbour Signal Station at all times. This state of affairs existed until 1956 when Lipton Cup fever gripped Port Elizabeth. This proved to be the fillip that local sailing needed. Harold Kohler visited Cape Town,caught the Lipton Cup bug and brought it to Algoa Bay. Each year the cup is competed for by recognised yacht clubs from Walvis Bay to Beira. It was during Harold Kohler’s visit to Cape Town in 1956 that this competition, being raced in 30 Sq.Metre class yachts, was in progress. Having watched this event, as Harold puts it, “I was persuaded to acquire ‘Trickson II.’ “Trickson II” was shipped to Port Elizabeth, where Kohier had coerced the Port Captain into allowing him to berth her in the harbour. The cost of shipping was one bottle of whisky for the captain of the coaster to ensure that she was lashed down snugly and securely. A crew of dinghy sailors from the river clubs was pressganged and they set about sailing her on the bay as often as possible. Having achieved a reasonable standard of proficiency, they took yacht and crew off to Cape Town in 1957 to see whether they could bring this Lipton Cup to Port Elizabeth. Racing under the burgee of the Redhouse Yacht Club they did precisely that through sheer consistency. Other yachts won one or another of the races but failed miserably in others while “Trickson II” steadily notched up good positions in all of them, even surviving a protest lodged in the last race. The Cup was theirs. The Deed of Gift stipulates that the winner can nominate the venue for the subsequent competition and, without hesitation, Kohler named Algoa Bay. Unstinting and enthusiastic co-operation was received from Charles Allen, then CO. OF S .A.S. Donkin, who gave permission for the 12 visiting yachts to be moored in front of the base. A number of local firms were persuaded to donate or loan equipment, some of these “loans” being somewhat permanent. A crane was fabricated and erected on the naval jetty for the stepping of masts, three hundred metres of heavy chain with mooring pennants spliced onto it was laid and eventually moorings were a fait accompli. Apparently there are still 12 anchors lying on the bottom of the harbour, remnants of those first twelve trots laid. Unfortunately for Port Elizabeth a local win did not happen. The race was won by Wilf Hancock who hailed from Durban. This left little hope for a similar event on the bay in the ensuing year. But local excitement had been whetted and it had been proved that the bay could provide conditions for sailing and racing which could be exhilarating yet not terrifying. There was no doubt that, by the end of 1958 sailing in the bay was a force to be reckoned with. It became apparent to that first committee formed at the public meeting in 1948 that a properly constituted club should be organised. Thus on 14 September 1959 the inaugural meeting of the proposed Algoa Bay Yacht Club was held at the home of Graham Packer. A committee was elected with Harold Kohler as President, Commander Charles Allen the Commodore, Scott Pearson became Honorary Secretary and Jerry Cullum the Treasurer. Committee members were Graham Packer, Mike Morgan, Stomp Mcdonald and Paddy Goodall. The object of the Club was quite simply stated – “The Club shall exist to foster interest in sailing.” An objective maintained and upheld to this day. To Stomp Mcdonald and Scott Pearson was delegated the responsibility of drawing up a Constitution, and the Club was up and running. By today’s standards the membership restrictions of that first Constitution were extremely narrow in that it stated that Membership shall consist of (a) Sailing Members and (b) Non active sailing members and shall be restricted to males only. The entrance fee was set at R20.00 and the annual subscription was R6.30. Graham Packer and Harold Kohler motored down to Cape Town and brought their persuasive powers to bear upon Admiral Biermann who gave Commander Allen permission to grant the club the use of what had been an Engineering Workshop in S.A.S. Donkin to use as a clubhouse. As a result of the nomination of ABYC by Noel Horsfield, the winner of the 1961 Lipton Cup , a fleet of 30 Sq’s once again graced the waters of the bay for the Lipton Cup and for the first time ABYC had an entry – Paddy Goodall’s “Sunmaid”. Harold Kohler was in there again with “Trickson II” under the Redhouse burgee while Graham Packer represented Zwartkops. Unfortunately none of these three local entries managed to win the event and the competition was not held in Algoa Bay waters again until 1998. 1962 saw disaster for the club. South Africa became a Republic and amongst all the other ramifications that this caused, security of Defence Property came under the spotlight. All civilian clubs were ordered off and ABYC was once again homeless. By now membership was fifty strong. Undaunted, meetings continued at a variety of venues. The popularity of the 3OSq’s as a class was waning and being superseded by a new breed of yacht, the Royal Cape One Design (RCOD). Tough, hard chined, slim, speedy craft, they proved ideal for our coastal conditions and the exhilaration generated racing them in heavy weather far outweighed the discomfort and wetness involved. Sadly the graceful 30 Sq’s left our bay and wore replaced by these more aggressive craft. Also gaining in popularity was a class of smaller boats, the Buccaneer, the first local of which, “Bird of Dawning”, was built and launched by Basil Weale. Eventually the Harbour authorities bowed to the inevitable and permission was granted to use a site “20′ x 25′ for the construction of a Gear shed”. This site is part of that presently occupied by the club. Members rallied around and they built themselves a Gear Shed which was officially opened on Friday 26 February 1971- this could account for the fact that Friday has always been something of a special night at the club. Not only was there somewhere to store all the tools and equipment needed for boat maintenance but also a venue where members could meet and exchange ideas and experiences. As all yachties know this was a thirst provoking pastime and a corner of the shed was devoted to the dispensing of ‘gear to satisfy this “need’ – an informal bar. And small it was – anyone who did a stint as barman was pinned behind the counter with barely enough room to breathe. In 1972 the RCOD and Soling classes held their National Championships on the bay with ABYC hosting the event. Algoa Bay was proving to be a popular sailing venue, so much so that the “Gear Shed” began to bulge at the seams. Early in 1973 steps were taken to start its expansion. Cunningly Bob Tait had anticipated this in his original design. Plans were submitted to the authorities for the addition of another floor – the club still being restricted to its original 20′ x 25′ site. Among the Port Authorities were now some who were far more sympathetic to sailing and the plans were approved. Once more the members turned their hands to construction work. The roof was raised and a floor put in its place with a cantilevered balcony overlooking the harbour. The process was long and hard with many a rainy evening being spent with no roof and the upper floor not yet completely in place and members enjoying the hard earned conviviality sheltering under umbrellas. It was decided to build a slipway operation and with members providing the spadework, it was laid and ran, as it still does today, beneath the lawn, from the Northern end of the building down to the water’s edge at low springs. A hand operated windlass was installed at its head but for some unrecorded reason they got the geometry wrong. The cable did not run parallel to the slip. As a result the hauling out of a comparatively small Buccaneer entailed a massive barberhauling operation to avoid an overriding turn on the windlass drum. Annual slipping was a hazardous feat involving not only plenty of muscle but also a careful calculation of time and tide if it was not to be carried out in icy water on a cold pre-dawn winter’s morning. The mid 1970’s was a period of consolidation and slow growth for the club. The fleet comprised some sixteen or so yachts each on its own swinging mooring and a racing programme was enthusiastically supported. Course marks were something of a problem; Bell Buoy was an obvious permanent one as was a dumping buoy just off the harbour entrance. This latter being used as the offshore end of a start line, the onshore end being the signal station. Someone then came up with the idea of dropping a mark off the Papenkuils River mouth, a location well clear of any possible shipping movement. What was not taken into account was that an approach to this mark necessitated crossing the outfall from the City’s sewerage system, a crossing often rendering the fresh sea breezes of the bay more than a little odorous and in a sloppy chop the oilies of weather rail sitting crew members bore evidence of their passage! An interesting alternative mark was sometimes used – marine traffic. Harbour facilities were such that there were often up to eighteen vessels anchored offshore awaiting berths so it was not uncommon for the Duty Officer of the day to designate one of these as a mark of the course. A plume of smoke from the mark indicating its obvious movement sometimes led to an interesting chase. The next significant event to affect the Club came about in 1975. Containerisation became a vital part of shipping circles and it was ordained that the Port Elizabeth Harbour be developed to accommodate this innovation. A massive container marshalling area was required, and amongst other things, the breakwater needed extending. To provide an area for the dumping and loading of the rock fill needed for these operations a reclamation of land from the front of Shop 17 was deemed necessary but this was a piece of water on which some of the club’s fleet luxuriated on individual swinging moorings. The reduced area of water allocated to the moorings was surveyed and members worked together to lay three rows of trots to which the yachts were moved. The land reclamation being completed and surfaced, truck load after truck load of rock was dumped thereon. On the side nearest the club a lower level quay, from which the rock could be loaded and taken to where it was needed, was built. At the end of the reclamation and extension this loading area became the hard and was acquired for member’s usage. As a bonus, when the contractors were clearing away all the surplus rock from the area it was suggested that some of it might be conveniently dumped into the water in front of the club, thus alleviating the contractors of the chore of having to transport it elsewhere. It was so dumped, a few truck loads of topsoil were thrown over it and the lawn was born. The Harbour Engineer, in no uncertain terms, expressed his consternation at the club’s own reclamation activities, but by then it was too late! Such was the expanding interest in yachting locally and the growth of the club’s fleet and membership was increasing rapidly so that once more the walls were beginning to bulge at the seams. In particular the shower and toilet facilities, still those of the original ‘gear shed, were becoming inadequate. Executive put its collective head together and extensions were planned. With some inconvenience to members over the following months the building was modernized and opened in February 1985. Inevitably, with all this growth in membership, the fleet was expanding not only in numbers but also in the size of yachts and more moorings were needed. After considerable research a plan was formulated and the first phase of the ‘walk-on’ marina came into being. Extensions and improvements in the form of protection from the surge by using a floating breakwater and the provision of power and freshwater points along its length have been ongoing. Ongoing enthusiasm for racing prompted the Vice Commodore in 1975 to institute an annual regatta “Algoa Bay Week” a regatta that has been held every year since then. The first one was prefaced by a boat show. It was held at the swimming bath at St.George’s Park. A small yacht was launched into the swimming bath itself for inspection by the public, various displays of yachting equipment were laid out and entertainment was provided by the Grey High School band. The piece de resistance of proceedings was a demonstration by the NSRI which, together with the South African Air Force performed a rescue operation. An inflatable dinghy floated in the swimming pool and from it a patient was air lifted into a helicopter. Unfortunately in one corner of the compound the band was playing at the time and as the helicopter hovered over the pool the downdraft from its rotor played havoc – with sheet music, music stands and uniform caps scattered far! The band was not amused but the spectators in the grandstand greatly appreciated the diversion. Prizes for that first Algoa Bay Week took the form of various commodities solicited from local business people. This created a problem for Bertie Reed, the Port Elizabeth born and educated , well known South African yachtsman who had came up from Cape Town for the event. He won the major race and was confronted with the problem of having to transport a large room divider home! The second half of the 80’s saw steady growth in the club both in membership and boat owners. This resulted in the clubhouse being doubled in size to provide a new ward room, offices, improved ablutions and the Chart Room restaurant. The boat owners were not idle either and got together to start the first phase of a new marina development, the first East-West walk-on being opened in 1989 and which saw the beginning of the end of the majority of the trot moorings. The early 90’s brought continued steady growth and financial stability but a dearth of sponsors for the annual Regatta, Algoa Bay Week, after losing the last major sponsor Opel (GMSA). The marina continued to grow, the restaurant flourished and sailing was very active under a succession of good sailing committees. 1995 saw Continental Tyre becoming a major partner and bringing Algoa Bay Week up to National standards and attracting visiting yachts from all over the country to sail in our magnificent bay. This strong partnership sadly came to an end in 2000 but despite this we continued to attract good entries to Algoa Bay Week each year as Conti Week had been a very good promoter of sailing in Port Elizabeth. The club had to let out some seams again in 1996 by extending the balcony area outside the restaurant and making a large deck area which proved a little wobbly even in a light breeze and the engineers had to be called in to make the structure safe and sound. They did such a good job that in the course of re-vamping the club in 2006, the deck was merely lifted and placed in deeper and stronger foundations! The deck was subsequently roofed and glassed in which proved a real draw card for The Chart Room. In 1997 Algoa Bay Yacht Club was chosen as the host for the 1998 Lipton Challenge Cup event held in August of each year at a venue chosen by the winning club. The organizing committee, ably headed by Vaughan Giles, put on a very professional event and this proved to be another great showpiece for the excellent organizing ability of ABYC and the great sailing conditions in the bay. The reputation of ABYC as an exceptional host for major events led to the J22 Worlds being held in PE in 2001, the African Optimist Championships in 2003 and the Mirror Worlds in 2007. After losing the Conti sponsorship, 2001 and 2002 saw Algoa Bay Week being supported by numerous small but very valuable sponsors, which enabled the club to continue this annual tradition, started in 1974 by Richard Edwards. 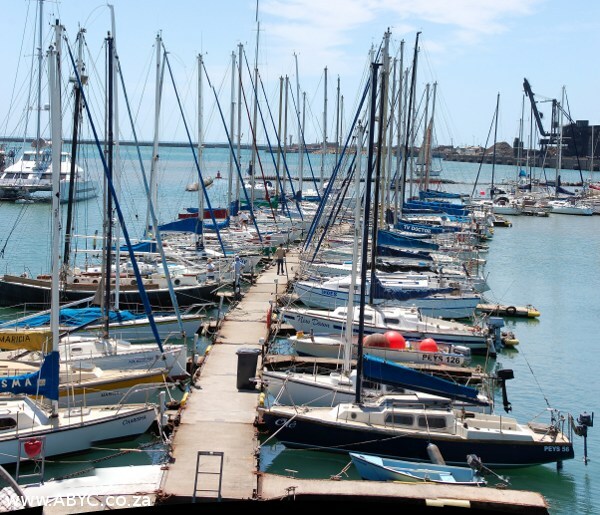 Zwartkops Yacht Club, one of the oldest yacht clubs in South Africa, was experiencing major difficulties in 2000 with seriously declining membership and support. The trustees approached ABYC with an offer to amalgamate and after some months of discussion ZYC became part of ABYC and members transferred over in January 2001. This provided a continuing active sailing venue for their sailing members and a friendly, welcoming watering hole for their retired yachties. The funds transferred to ABYC were used to build the slipway and breakwater wall at the front of the club so that junior sailors would have a good place to park dinghies and to launch. This revived interest in dinghy sailing, which has continued up to the present day with many children being taught to sail over the years. Our old friends General Motors South Africa, came to the fore in 2003 and together with the Nelson Mandela Metropole, sponsored Nelson Mandela Bay Isuzu Week in a three year contract ending in 2005. This was one of the most successful sponsorship partnerships and in 2004 the biggest fleet ever to sail offshore in Port Elizabeth participated in a great week of racing. There were three courses, two bridge boats, 6 classes including multihulls, and a total of 98 boats took to the bay! As 2005 moved on into 2006, the continued and protracted negotiations with National Ports Authority regarding the lease of land and water, on going since the early 1980’s, was coming to a head and February 2006 saw a positive change in the negotiations and a new lease was finally was agreed and signed on 17 May 2006. Following hard on the heels of success, came devastation. On Sunday 21 May 2006, the original section of the ABYC clubhouse was completely destroyed in a fire which started in the bar. Fortunately, it was found to be no fault of the club and our insurers met the bill. Designs were submitted arid approved by the membership and the phoenix was on track to rise again. The Mirror Worlds were held in January 2007 and the overseas visitors, particularly the Irish, were most impressed at ABYC’s expertise in being able to arrange such a major event in the midst of such chaos. The members must be applauded for their patience and support during the very trying re-build period. And here we are in 2009, fifty years down the line, with a fabulous venue, a great clubhouse, a marina which caters for over 130 boats, a membership body that may be a little creaky but which continues to support the club, lessons learned from our successes and our failures, and ultimately, always the promise of better things to come in the next 50 years! Gerry Baker and Lesley Webber (as at 2009).